extensive product list we have a solution for every need. Cadena Inc. has a full line of drive up banking systems available. From the vision window to multi-lane pneumatic drive up banking facility we have the solution for you. With over 300 years of aggregate experience we will work with your architect and general contractor to insure a smooth project and timely installation. All drive up products are available as line of sight systems or integrated one way or two way video. Identifying a drive up customer with an integrated camera at the customer unit is made easy with our motorized camera that can be adjusted up and down by the teller console. No longer do you need to settle for an image of the roof of the sport car or the door of the SUV. To browse our drive up banking system offerings please follow the links below. The Fortis Teller Kiosk provides an attractive, economical solution for walk-up transactions. The compact 34" high x 27" wide footprint installs through a wall with the teller unit installed in a remote area. 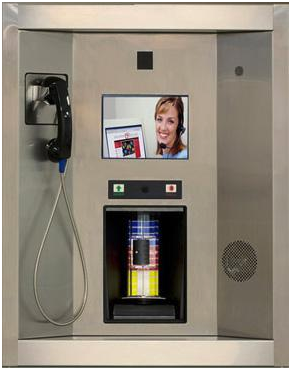 The Teller Kiosk can increase security and employee efficiency. The Teller Kiosk can be used to off load traffic in a busy location, extend walk-up hours when installed in a vestibule or provide tellers with a more secure environment.